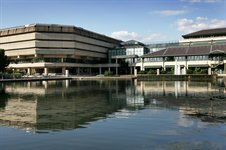 We are delighted to confirm that Cattaneo Commercial have been appointed by The National Archives to market some surplus office accommodation, comprising a self-contained air conditioned suite of 4,465 sq ft, set within their attractive, campus style headquarters at Kew, Richmond, within 5 minutes' walk of Kew Gardens station. This prestigious suite benefits from shared access to the landscaped grounds, including two large ponds as well as an on site cafe, restaurant and on site parking. Click here for further details or call Andy Armiger on 020 8546 2166.